It was so perfect that it almost seemed staged, though the truth is that it was the only part of the event that I had not thoroughly prepared for- in fact it came as a total surprise! You see, I was taking a group of 15 people, new residents in Tsukuba who had come from various parts, on a walking tour in one of the city`s old neighborhoods- Teshirogi (手代木). It was the second of a three part event sponsored by the Matsushiro Public Hall on the history of Tsukuba, which consisted of a two hour lecture, the just mentioned history walk, and finally a bus tour- all conducted by yours truly. For the walk, I had gone over the course I had in mind three times and prepared myself for every possible question: the names of all the plants, trees and crops we would see along the way, the detailed histories of the shrine and temple we would visit, and the details concerning the old sacred stones we would see by the side of the road. All this was done in an effort to convey to those who joined the class just how distintive this area`s history and culture are ( when compared with Japanese culture in general). I also intended to point out the great contrasts between the new Science City, which was plunked down suddenly on this area in the mid 1970`s, and the traditional old hamlets which are scattered in and around it- treasure troves of folk culture and customs. And so we began our walk. After we had crossed route 408, which separates Matsushiro, long a deep dark pine forest which forty years ago was cut down and turned into a modern residential area (including several clusters of official housing for scientists and academics), from Teshirogi, a hamlet founded more than 5oo years ago when one of the retainers (named Nakajima) of the old Oda Castle ( which long stood near the foot of Mt Tsukuba) took refuge in that area and took up the farming life after the Oda Family had been defeated and the castle lost. It is only a few paces across the road, but it is like stepping into another country. We passed fields of burdock, yam (replete with baby yams- MUKAGO- a rustic treat in Japan)- and TOBACCO ( long an important crop in the area). We then came to an old shrine of which the above-mentioned Nakajima Family is still the custodian to and also a temple whose main hall was actually an old school house that had to be moved to make way for the construction of some official residences and was later used as the headquarters for the anti-Tsukuba Science City Movement ( which was especially strong- even violent- in the Teshirogi area). All in all it was a nice walk and a beautiful day- but just as we headed home we came upon the greatest treat of all for our members ( who are interested in the history and culture of the area). Coming back near route 408 we passed a small grave yard- which was stirring with activity. Incense was burning and four or five old farmers were busy with something. We stopped to look. And there, as if I had planned a showing of unique local customs, was one of Tsukuba`s most distinctive traditions- placing steamed sticky rice (MOCHI GOME) and azuki bean-paste between two straw sandals (WARAJI) making a sandwich, and then suspending this over a grave of a person who had died 35 days earlier (counting the day of death as the first day) . 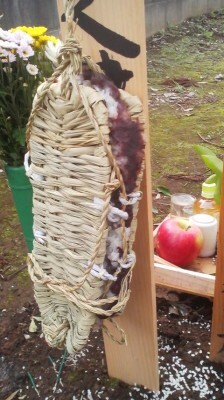 This custom is called SANJUU NICHI HO-YO- (the Service of the 35th Day), or GO SHICHI NICHI ( the Fifth Seventh Day). The fact that there is a special ceremony held at the grave on the 35th day after death is one of the things that make this custom distinctive. If you are familiar with Japan and Japanese culture you will know that it is the 49th day after death on which major ceremonies are held. Historically, however, the Japanese have held services every seventh day- which is why the service on the 35 th day in called the Fifth Seventh Day (Go Shichi Nichi). In no part of Japan, however, except for this area, did these ceremonies involve making sandwiches with straw sandals. rice, amd bean paste. And that is why what we saw on that day was so special. Even just across the Kokkai River, on the neighboring towns of Ishige or Mitsukaido (now part of Joso City) where they DO hang the same sandal, rice and bean-paste sandwiched over graves it is at a different time- one month after death or on the 49th day, respectively. And oh, I almost forgot! Why do families do this for their deceased loved ones? What is the significance of the sandals, the rice and the beans? Well, the answer is easy. 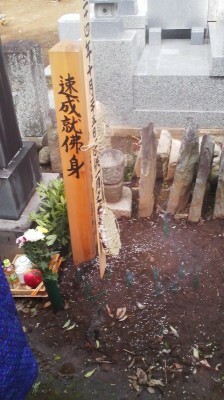 The Japanese have ( in general) always been concerned about taking care of the spirits of the dead- especially those of family members who have passed on. 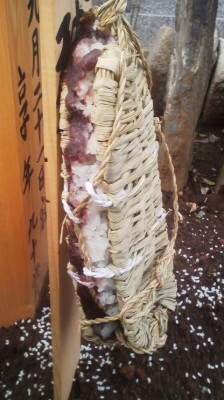 And since it is believed that the souls of the dead will cross rivers (Sanzu no Kawa) and make their way over thorn or needle covered mountains (Hari no Yama or Tsurugi no Yama), the sandals and sticky rice are meant to provide traction (to prevent slipping) and protection (from piercing) on that difficult journey in that other realm ( the stick from which the sandals are suspended can also be used as walking support!). The rice and bean paste- a combination called BOTA MOCHI in this area- is believed to provide sustenance AND as one local resident suggested to me, the resources for a possible bribe to be given to Lord Emma, who decides the fate of all those who come before him. 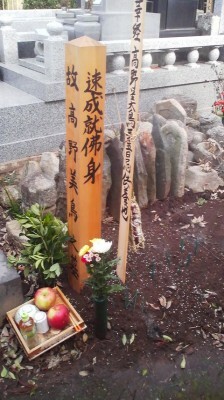 All those who attend this service then usually enjoy eating some BOTA MOCHI of their own.